VLC is one of many successful open source application out there. It supports wide range audio and video formats, and it completely free. 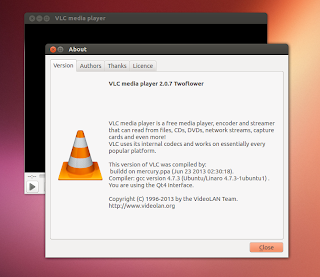 VLC is available by default on Ubuntu's official repository, so you can install it easily from Package Manager. Unfortunately, sometimes there is a delay between VLC released by the author and VLC which is available on Ubuntu repository. Many of us like the latest version of application. Installing the latest version of software, letting us have more features, enhancements, and less bugs. Today, I'd like to show you how to get the latest version of VLC for Ubuntu 13.04 Raring Ringtail, Ubuntu 12.10, and Ubuntu 12.04.